Good News Club resumes January 18th! To sign your child(ren) up for GNC during the 2018-2019 school year, please fill out this registration form and turn it in to the school front office. We look forward to sharing the Good News with the next generation and thank you for the opportunity to do so! 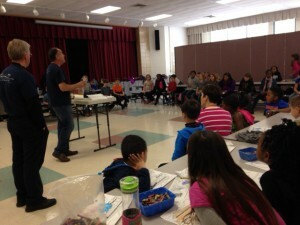 The Good News Club at Park Hall Elementary School is sponsored by The Point of Grace Church. The club is held on Fridays from 3:30 to 5:00pm each week. It is for students in K through 5th grade. Permission forms to stay after school, which are to be completed by the child's parent/guardian, are available in the school office. There is no fee to attend and join the club. Please check the church calendar for days the club will not meet due to school holidays, closings or in-service days. The clubs are led by teams of caring and competent adults trained by Child Evangelism Fellowship (CEF) staff. Each club time includes an exciting visualized Bible lesson, songs, Scripture memory, a missions story, review games and other activities that help instill a Biblical worldview. Good News Clubs are more popular than ever following the Supreme Court ruling on June 11, 2001 allowing Good News Clubs to take place in public schools across America. You can read more about Good News Clubs at http://www.cefmaryland.org. If you desire to speak to someone directly, please call 240-561-3815.